The second issue of Shade continues the manic pacing and style laid down by the introductory issue. Ditko is obviously interested in telling a lightning-fast story about a man trying to prove his own innocence in a very limited amount of time. This gives the comic a very cinematic feel, as if we're looking at the first act or two of a film. It would be a very weird film. I'm impressed by Fleisher's dialogue. According to the introductory writings at the end of the comic, Fleisher "reads over Steve's carefully prepared plots and puts in the actual words into the mouths" of the various characters. I'm fairly certain this is what was once referred to as "The Marvel Method." What I'm curious about is whether or not Fleisher saw any of the layouts or sketches before putting in the dialogue. I suppose he must have. If Ditko plotted the book, he likely drew it and then sent it to be dialogued. It's an interesting way of creating, as it really puts someone who would traditionally be called the writer of the work on a significantly lower level that the person who would traditionally be called the artist. Fleisher doesn't have a great deal of creative freedom in the project. Yet his dialogue is smooth and natural. It's a 70s comic, so it does suffer from "Claremontitis," i.e., ridiculous amounts of exposition ensconced in thought bubbles, but even that seems a lot less stilted than Colossus' internal monologues of the 80s Uncanny X-Men. One strange quirk of the book is that, so far, on the covers Shade is seen wearing only his M-Vest, yet within the pages of the comic, he tends to wear the vest under street clothes. I'm assuming this is because the vest resembles a superhero costume, and that superhero fans are the demographic at which the book was aimed. But it certainly doesn't read like a superhero book. Shade is on the run, playing mobsters against one another in order to clear his name, and really only tangentially saving anybody. 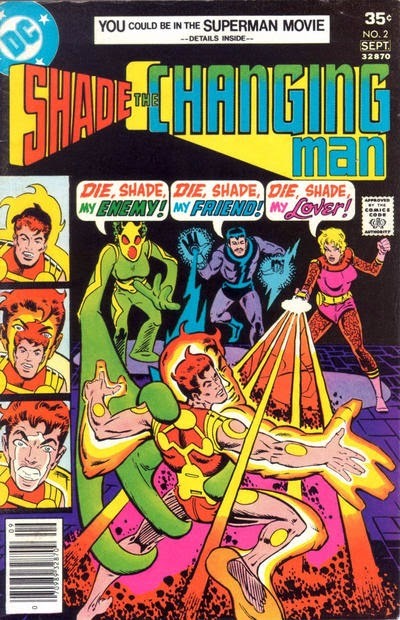 As a DC comic in the 1970s, one would have expected a guest appearance by Superman or Batman at the least by now, but Shade and his antagonists seem to exist in a world all their own. I'm curious as to whether we'll see him enter the DCU proper within Ditko's truncated run on the book, or if he was simply pasted into the DCU after his own book was cancelled. Answers forthcoming, either way, I guess.